When Greenpeace Argentina started looking at Facebook in 2008, it was clear the social network was growing. A mere five years later, the organization is celebrating reaching 1.5 million Facebook page fans. To mark this milestone, Greenpeace Argentina created a video and blog post to share the story of their success. Facebook offered the organization new forms of participation and collective creativity as well as a way to immediately interact with followers and provide a way for them to communicate with one another. 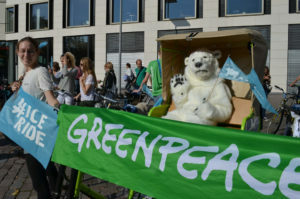 Mariana Diaz Vaccaro, online mobilisation co-ordinator at Greenpeace Argentina, shared highlights and lessons from the organization’s Facebook experiences in a recent Skype interview. While today it may seem like common practice for companies and non-profits to have an employee focused on the organization’s social media presence, this was not the case when the Greenpeace Argentina office decided to hire a community manager for its social networks. Four years ago, when the office hired Greenpeace Argentina community manager Pablo Bullrich, the feeling was that focusing solely on social media was not considered a real job. “But I think it was really one of the best decisions because we could discover a lot of things about social media, having a person really dedicated,” says Mariana. Pablo was hired to manage the Facebook page, generate content and ensure contact between the organization and its followers. “At first no one understood very well what I was doing, but eventually they discovered the value of having another channel to communicate with people and an infallible campaigns tool,” Pablo says in the blog. In July 2010, Greenpeace Argentina was working on an electronic waste campaign, called What Goes Around Comes Around. The campaign demanded battery manufacturers take responsibility for the 10 tons of batteries being stockpiled in Buenos Aires and then exported for recycling. Duracell became a focus, and using a strong social-media strategy to accompany an online petition people were asked to write their complaints on the Duracell Facebook page and its owner company, subsidiary brands, and on the company CEO’s page. 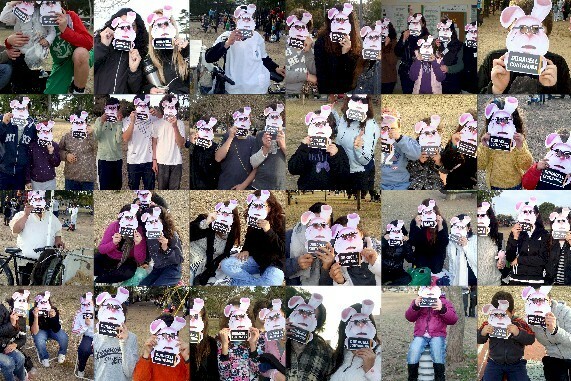 The slogan “Bunny yourself” encouraged people to submit a photo using an Energizer Bunny mask. Public support was massive, with people sending in images of themselves dressed as bunnies. As part of the campaign the major companies’ icons were created with an evil image. Activists in the street characterized as pets with the brands’ logos were shown being detained by the police. 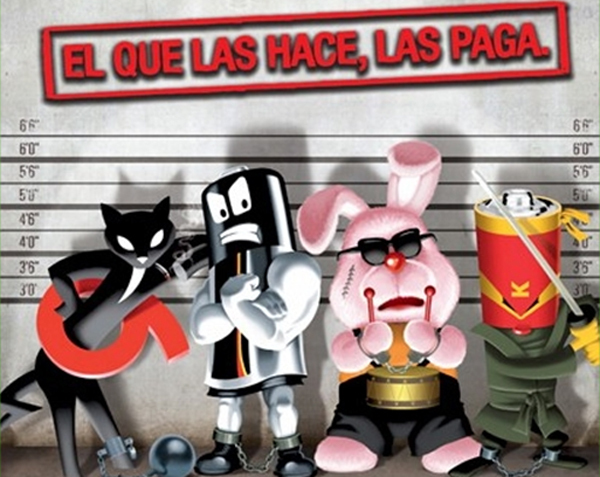 Icons of the recognizable battery brands were given an evil look as part of the campaign. People were encouraged to use Facebook and Twitter to send messages to Duracell and ask the company to be responsible. While it is now more common to use Facebook pages to write on a company’s wall and ask questions, Mariana notes at the time of this campaign it was a new idea, and this was the first time one of their campaigns really damaged a brand. Greenpeace Argentina encouraged people to use Facebook to ask P&G and Duracell to be responsible for the battery waste. 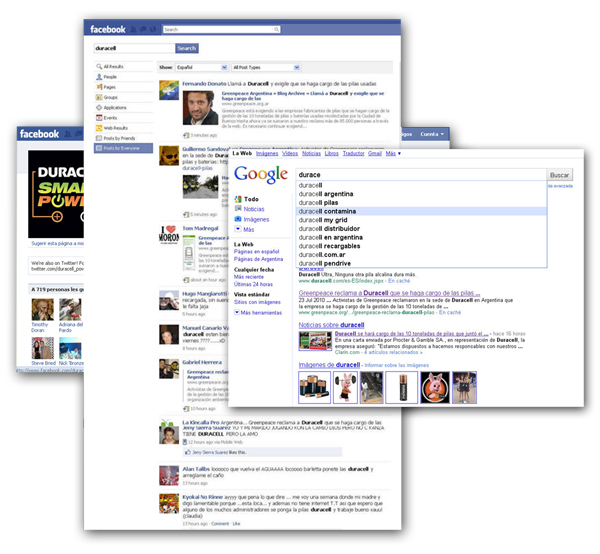 Online searches for the brand found information about the campaign. Employees at Procter & Gamble (P&G), which manufactures Duracell, were reached out to on social networks and informed about the pollution issues. Because the fan base within P&G was not very active, Mariana says they found an active community in the diapers company Pampers, which is also a P&G brand. People were asked to call the P&G CEO and ask questions, which Mariana says was an excellent campaign tool. Depending on the answers people received, Greenpeace Argentina gave suggestions of the next question to ask. After three months of the campaign, Duracell committed to treating its electronic waste. Mariana recalls they were told Duracell CEO’s daughter was asking her father why the company wasn’t treating the waste. Energizer, fearing public exposure, took the same responsibility. Greenpeace Argentina joined a Greenpeace International campaign that used Facebook to make demands from Facebook, asking the networking organization to stop using carbon-based energy in their new U.S. data centres. A Guinness World Record was achieved in 2011 for the greatest number of comments on a Facebook post in 24 hours. People were asked to comment on a Facebook page entitled Unfriend Coal, resulting in more than 80,000 comments. The campaign was a success with Facebook committing to working with Greenpeace to promote renewable energy. Thanks to its many followers, Greenpeace Argentina’s Facebook page became the biggest non-commercial Facebook page in the country, ranking No. 16 in the top 50. In addition, the page has one of the highest participation levels. Between 120,000 to 200,000 people watch, comment and share posts and photos from the page every minute. In its last campaign, “Salvá San Guillermo” focused on saving the San Guillermo reserve from mining, Facebook once again has proved to be an asset. Forty-five per cent of the 372,000 signups over three months came from Facebook, half of which were new participants. Answering your fans and answering them fast is one of the most important things for building a Facebook community, says Mariana. Even in cases where you aren’t sure you have the right answer, it is still imperative to respond. Using images with each Facebook post is a lesson the team learned during the last campaign. Facebook Greenpeace Argentina includes an image with an embedded link in each post. Each post also includes one only call to action. Investing in stories through Facebook’s “sponsored stories” option increased visibility and created new cyber activity, says Mariana. Through investing money on a post, fans and friends of fans are more likely to view the post. The organization aims to post twice a day, to allow time for the post to grow. Mariana says she hopes Facebook can be a tool for winning campaigns. There are a lot of possibilities for using the social-media platform, she adds. “Of course, it’s not that Facebook is going to save the world; people are going to save the world. Facebook is just a tool for doing that,” says Mariana. 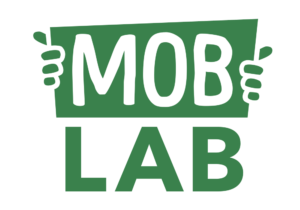 She would like to see more understanding of how to integrate online and offline interaction, for example, how people who mobilise online can also organize themselves in the street.